First off, Richard Lischer has some serious skill as a writer. The man just rocked some masterful prose. And he did a very good job of highlighting the development and pathos of MLK's homiletical genius. He also captured the spirit of the Black American church in the 50's and 60's quite well. I loved his juxtaposing of the character of King's activism to that of Malcom X's. This was an inspiring and informative read. Frankly, though, the book droned on at the end and could have been chopped down 75-100 pages and it wouldn't have suffered a bit for it. Highly recommended, particularly for those interested in the homiletics of the black tradition. A great look at MLK's preaching, and the centrality of it within his greater role in society. The book at times assumed a fair amount of historical background and knowledge, but overall it was a good read that illuminated a different sid of MLK than a biography would. 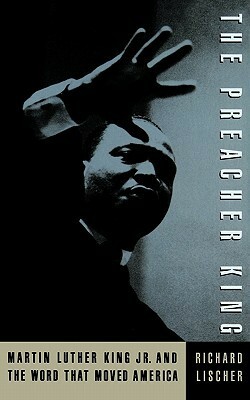 This book is an analysis of Dr. King's preaching. The author goes into great depth about the theologians and preachers who influenced King, as well as discussing the traditions of the black church in America. Dr. King was a marvelous preacher (although a bit heavy on the metaphors, in my opinion) and it was fascinating to read about the various influences on his world view, his religious beliefs, and his sermons and speeches. I was especially struck by the author's discussion of King's two views of America. First, King spoke about an America that pre-existed: America's potential for greatness as ensconced in our founding documents and our (as King would have said) self-assured belief that America has God's special favor (the whole 'city on a hill' trope). King truly believed that we would, one day, live up to our nation's creed. You've seen the same footage that I have: a young, handsome black preacher with his beautiful wife, appealing to the better angels of our nature in Montgomery and Birmingham. It's a wonderful image.By the end of his life, though, Dr. King had taken on a much more prophetic role in judging America's soul. His experiences in Chicago (the book doesn't actually talk much about that time, but I am very familiar with Dr. King's biography), the escalation of the war in Viet Nam, and President Johnson's failure to make good on his Great Society promises with regard to the poor, led to Dr. King assuming a very different view of America. Dr. King, quite literally, wondered if America was on its way to hell (which was the title of the sermon he was due to preach the Sunday after he was killed). People are much less familiar with this part of Dr. King's legacy, which is tragic because once the de jure segregation he struggled so hard against was removed by the Civil Rights and Voting Rights Acts of the mid-sixties, he began to take on the triple evils of American culture: racism, militarism, and poverty. He became a much less beloved figure on both the political Left ("not radical enough!") and the Right ("stick with civil rights!"). Dr. King remains my favorite figure in American history. I am looking forward to seeing the new memorial dedicated to his life and legacy in Washington. His is a remarkable and tragic story, and this book--academic and dry as it is--shed a new light into the mind of a great hero of mine. I'm not sure how many books I've read about Martin Luther King, Jr., but I never fail to learn something new about him, and about our country, when I do. Lischer gives a thorough and critical view of who Martin Luther King Jr. was as a preacher and as a Christian pastor. King's leadership of a national movement tends to obscure the reality that he did what he did as a black man, but also as a preacher of the Gospel. Lischer brings that latter point into focus. Some evangelicals fail to appreciate how King saw the Gospel. They may even dismiss the Gospel he shared. But King's message was more rooted in Jesus' teachings and actions than is the individualistic "get-to-heaven" message white American evangelicals have propagated over the period of 1970-2010. Lischer's work helps me appreciate King and reminds me of who I am to be as a Christian. It's easy to forget that this great leader of Civil Rights Movement in the United States of America identifies himself first and foremost as a preacher. Lischer skillfully analyzes the various aspects of MLK's African-American environment, upbringing, education, mentorship, and experiences that formed MLK's understanding of his involvement in the movement as an extension of his call as a clergyman. Detailed review of King's rhetorical and oratorical style, including his influences. Important for anyone wanting to understand and study his rhetoric; perhaps not quite as interesting for the general King devote' (though I found it generally worthwhile). Makes the important point that King's rhetoric cannot be divorced from his training, passion, and calling as a minister. I really liked this book. The author examines Dr. King’s work in the pulpit - both in his pastoral work and in his civil rights leadership. It is an interesting examination of the spoken word in sanctuary and in the streets. The author’s historical research and analysis are rich and add a great and unique dimension to the work done on Dr. King’s legacy. I’m very glad I read it. helpful analysis of dr. king's homiletical method. wished the chapter at mass meetings, which included helpful examples of how dr. king structured sermons in those vital settings, was earlier. raised, but did not greatly detail, the use of improvisation in African American preaching. guess i'll have to wait for dr. alcantara's thesis for clarification on the latter practice. Very good read. Very interesting. Traces MLK, Jr.'s development as both a preacher and civil rights leader by closely analyzing both his sermons and his social context, and notes his grounding in the Gospel and the theological foundations of his belief in non-violence. Merges King's religious and political life with the changes to his homiletic style. Fascinating read.